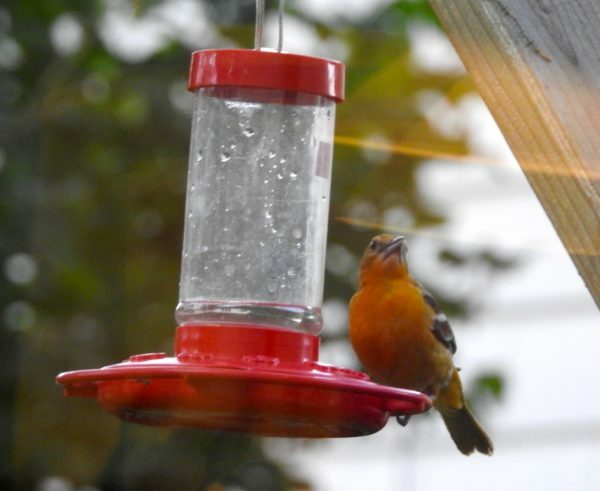 Baltimore orioles have been visiting our hummingbird feeder and splashing the sugar-water everywhere. I don’t mind. They’re fun to watch and don’t seem to scare off the hummingbirds—at least not often. Here’s one of the orioles, as seen through my kitchen window in the early evening. You can see the ceiling light’s reflection against the glass, just above the oriole’s head. This one is a female, which you can tell because it doesn’t have a black head. Not a great shot, but I’m still learning to use the camera so over time the shots should get better. One hopes so, at least. >> Read more of my posts about birds.